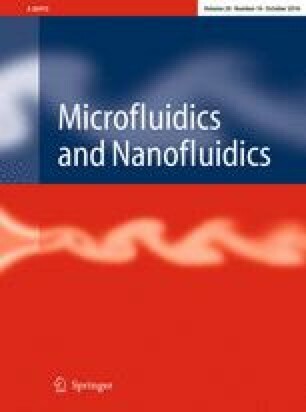 In microfluidics, flow focusing is widely used to produce water-in-oil droplets in microchannels at high frequency. We here report an experimental study of droplet formation in a microfluidic cross-junction with a minimum number of geometrical parameters. We mostly focus on the squeezing regime, which is composed of two distinct steps: filling and pinching. The duration of each step (and corresponding volumes of each liquid phase) is analyzed. They vary according to both water and oil flow rates. These variations provide several insights about the fluid flows in both phases. We propose several scaling laws to relate the droplet volume and frequency to the flow rate of both phases. We also discuss the influence of surfactant and channel compliance on droplet formation. The online version of this article (doi: 10.1007/s10404-016-1807-1) contains supplementary material, which is available to authorized users. This work is supported by the FRIA/FNRS and the Interuniversity attraction Poles Programme (IAP7/38 MicroMAST) initiated by the Belgian Science Policy Office. All the microfabrication was perform in the clean room of the Microsys laboratory (ULg), whereas the fluid manipulations and high-speed recording were performed at the Microfluidics Lab (ULg). We thank Stéphane Dorbolo (GRASP, ULg) and Benoit Scheid (TIPS, ULB) for their help, the sharing of their equipments, and for relevant comments. We also thank Corentin Pirson for his preliminary work on modeling the compliance of tubings.